Undecoded Barcode reader for connection to controllers. 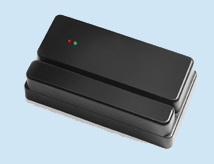 The Slot1 is an undecoded barcode swipe reader, for use in installations where direct barcode input is supported, such as various access control controllers. The Slot1 is available with either visible or infrared optics, with a ttl or open collector output.